Naturalized in Bordeaux in 1731; died in 1751. In 1696 he had established the great mercantile house whose trade relations extended to England, Holland, southern France, Canada, and the French West Indies, nearly all the transoceanic trade being in its hands. In return for sugar and indigo, the firm exported to Cayenne. Martinique, and Santo Domingo cargoes of alcohol, linen, meal, pickled meat, and wine. The serious financial crises of the years 1715 and 1719 did not materially injure any of the firm's commercial interests. 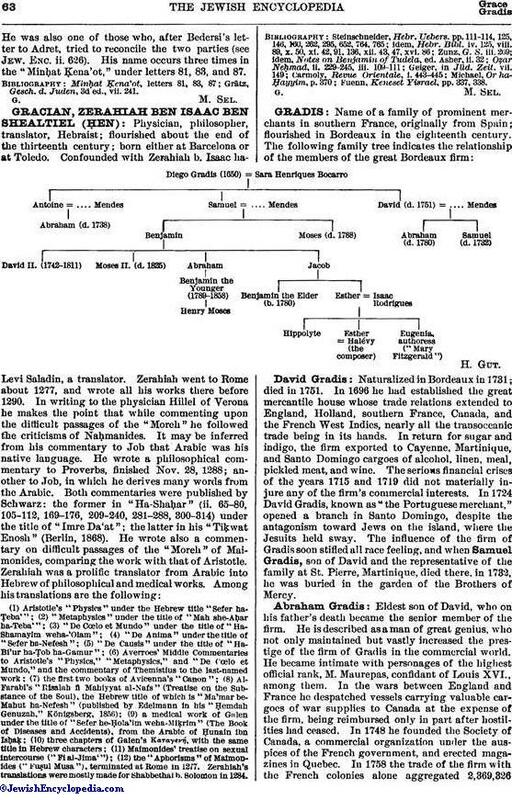 In 1724 David Gradis, known as "the Portuguese merchant," opened a branch in Santo Domingo, despite the antagonism toward Jews on the island, where the Jesuits held sway. The influence of the firm of Gradis soon stifled all race feeling, and when Samuel Gradis, son of David and the representative of the family at St. Pierre, Martinique, died there, in 1732, he was buried in the garden of the Brothers of Mercy. Eldest son of David, who on his father's death became the senior member of the firm. He is described as a man of great genius, who not only maintained but vastly increased the prestige of the firm of Gradis in the commercial world. He became intimate with personages of the highest official rank, M. Maurepas, confidant of Louis XVI., among them. In the wars between England and France he despatched vessels carrying valuable car-goes of war supplies to Canada at the expense of the firm, being reimbursed only in part after hostilities had ceased. In 1748 he founded the Society of Canada, a commercial organization under the auspices of the French government, and erected magazines in Quebec. In 1758 the trade of the firm with the French colonies alone aggregated 2,369,326francs. From 1759 to 1763, after Canada had ceased to be a French possession, the export trade of the firm amounted to 9,000,000 francs. Nor is it unimportant to mention the activity of the firm of Gradis in the exchange of French prisoners held in England; these prisoners were supplied with food and clothing at the expense of the firm through agents stationed in London. The coffers of the state having been depleted owing to the cost of the wars, the house of Gradis was more than once seriously embarrassed. Upon one occasion, being hard pressed for funds, Abraham Gradis urged Minister Berryer to honor his claims. 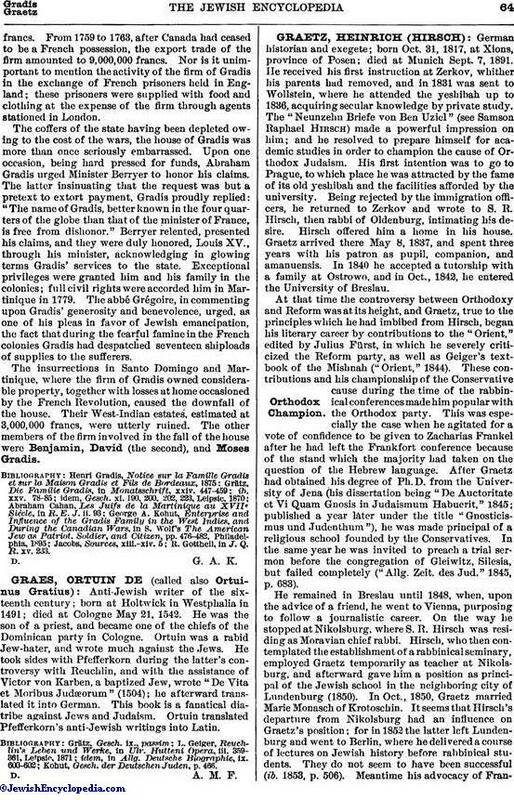 The latter insinuating that the request was but a pretext to extort payment, Gradis proudly replied: "The name of Gradis, better known in the four quarters of the globe than that of the minister of France, is free from dishonor." Berryer relented, presented his claims, and they were duly honored, Louis XV., through his minister, acknowledging in glowing terms Gradis' services to the state. Exceptional privileges were granted him and his family in the colonies; full civil rights were accorded him in Martinique in 1779. The abbé Grégoire, in commenting upon Gradis' generosity and benevolence, urged, as one of his pleas in favor of Jewish emancipation, the fact that during the fearful famine in the French colonies Gradis had despatched seventeen shiploads of supplies to the sufferers. The insurrections in Santo Domingo and Martinique, where the firm of Gradis owned considerable property, together with losses at home occasioned by the French Revolution, caused the downfall of the house. Their West-Indian estates, estimated at 3,000,000 francs, were utterly ruined. The other members of the firm involved in the fall of the house were Benjamin, David (the second), and Moses Gradis. R. Gottheil, in J. Q. R. xv. 233.